My arms shook as I lifted them to the clothesline, attempting to hang wet laundry out to dry. I could hear my heart beating in my chest as my eyes darted left and right. I was convinced someone was going to jump over the wall into our rental property. Just like the day before. My eyes kept going back to the wall where the burglar had crouched the previous morning, after he smashed the window next to our back door. Broken glass was still scattered on the ground. My pulse would not slow down. It tightened in my chest and caught my breath in its grip. I had watched the same thing happen to a few different friends. They each had post-traumatic fear symptoms that lingered for months after being mugged on the streets of Cape Town. Fear is a crippling enemy. It breaks us down with a breath and brings us to our knees. The question is, what do we do once we’re down there? 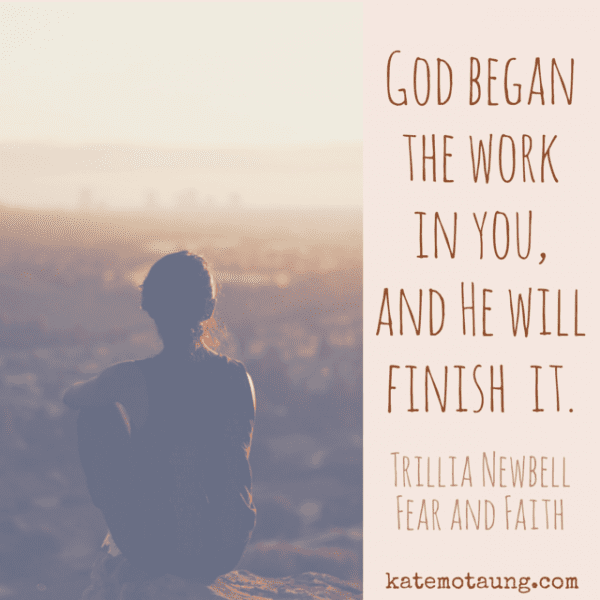 In her new book, Fear and Faith: Finding the Peace Your Heart Craves , author Trillia Newbell urges readers to turn to God and His Word. Trillia believes that the Lord is the one who can give us the peace that passes understanding — even in the face of fear. I agree — not only because the Bible says so, but because I’ve experienced it myself. Standing outside at my clothesline the morning after our attempted robbery, I knew I had a choice. I could let fear get the best of me … or I could ask God for help. By His grace and with His help, I chose the latter. My fears didn’t dissipate instantly. My pulse didn’t immediately slow to a regular rhythm. But He helped me stay out there in my backyard when I was tempted to go back in the house. He helped me sleep at night when the glass was still broken and the wind howled through the house. He stilled the raging storm for His disciples, and 2,000 years later, He stilled my fearful heart. 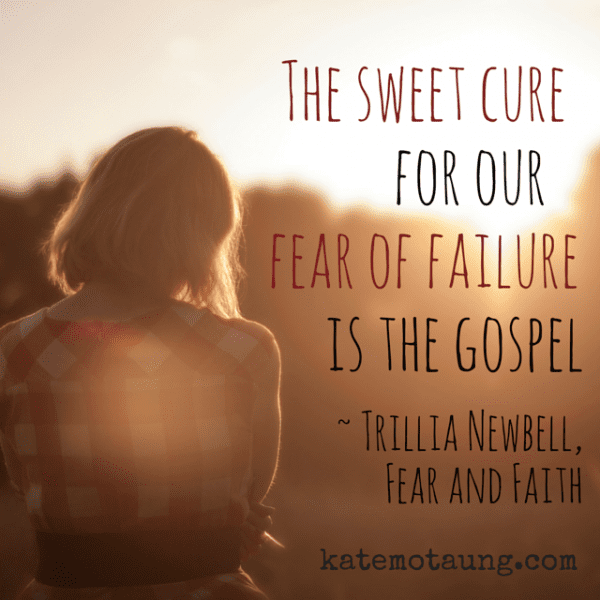 I recently had the pleasure of interviewing Trillia Newbell, author of Fear and Faith: Finding the Peace Your Heart Craves . I received a review copy of this book from Moody Publishers, and it was such a delight to meet Trillia via video. Click the video below to be encouraged by Trillia’s words of wisdom and vibrant personality. You’ll see that she is a woman who loves God and His Word. As I mention in the interview, one thing that pleasantly surprised me about this book was the broad coverage of the topic of fear. Before I started reading, I anticipated the pages to address issues such as a fear of death, fear of loneliness, fear of sickness, etc. What I didn’t expect was to find a whole section on the fear of man. Trillia’s dealings with the fear of man were some of my favorite parts of the book. She hits the nail on the head when addressing current trends: “Social media has a way of pulling out the fear of man. We check to see who has ‘liked’ our post or picture, fearing what we write, hoping to be noticed.” Does that sound familiar? No matter what fears you fight against — whether it’s the fear of a burglar breaking into your house or the fear of other people’s opinions, Fear and Faith: Finding the Peace Your Heart Craves is a helpful, biblical resource. It is full of rich, gospel content and points readers to the One who has overcome the world and all its fears. 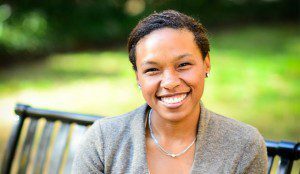 Trillia Newbell is the author of Fear and Faith: Finding the Peace Your Heart Craves (2015) and United: Captured by God’s Vision for Diversity (2014). Her writings on issues of faith, family, and diversity have been published in the Knoxville News-Sentinel, Desiring God, Christianity Today, Relevant Magazine, The Gospel Coalition, and more. She is currently Director of Community Outreach for the Ethics and Religious Liberty Commission for the Southern Baptist Convention. Along with writing, she is pursuing her M.A. in biblical counseling from Southern Theological Seminary. For fun, she enjoys group fitness (she used to be a fitness instructor! ), cycling, and listening to a variety of music. Trillia is married to her best friend, Thern, they reside with their two children near Nashville, TN. You can find her at trillianewbell.com and follow her on twitter at @trillianewbell. Two of my most frequent fears include something happening to my kids or grands or losing my job again. It’s an odd place for me to be. Prior to losing my job 2 1/2 years ago, I’d have said I don’t live with a lot of fear. Hardly any at all. So still praying about letting go of the fear and trusting the provision of our Father. I have lots of fears (anxiety issues abound with me! ), but my kids getting sick tops the list usually. I come close to having panic attacks if I even hear of someone in one of their classes throwing up and then for days can’t stop thinking about what if they get sick. This could be a great read for me, I think! Beth, I do the same thing!! I will even keep my daughter out of school sometimes when I hear there is a stomach bug going around hoping she will avoid it. Then it haunts me for weeks! So excited to see this author video interview, and the fear of man section was brilliant. Thanks for sharing! I just wrote a blog post about posting things on social media just to get likes! I can’t wait to Meet Trillia at the retreat! I’ll see if I can find your post as I’d love to read it. One of my biggest fears lately is loosing one of my children to anaphylaxis as two of them have severe food allergies. They are allergic to milk, eggs, nuts, peanuts, wheat, bananas, avocado, beans, pork, pineapple, and beef. They have almost died a few times now from accidental exposures and from actually doing food challenges at Food Allergy Clinics at some of the best doctor’s offices in the U.S. They are known to have some of the most severe cases seen by doctor’s across the country. It’s scary and I just keep trusting in God in knowing He knows what He’s doing. This sounds like a great book. Thanks for sharing about it! Fear is my worst enemy and it comes when you lest expect it and steals your joy. Trillia’s book would be amazing to read. I struggle with a fear of being alone, ie. unmarried, for my entire life. I haven’t really come up with anything that combats it on a permanent basis. I just try to hold on to the thought that the opposite of fear is faith. Faith in the Lover of my soul. death of loved ones – have to put them in God’s hands. Death of my husband and children. Just keep turning them over to God and knowing and believing that God is faithful and He is good all the time. So hard to put a name to it. I guess, in general, I fear that evil will win. Not in the long term, I’m fully aware that, ultimately, evil loses, but in the meantime, there are days I watch it winning and the people suffering and that just doesn’t seem enough. I have to keep my eyes fixed on Christ. I imagine myself as Peter walking toward Jesus on the water, knowing that the waves are my fears and that the moment I look at them instead of Him and His Perfection, I will, and do, begin to sink. I feel like I fear a lot of things, but I’m good at masking them. I fear for my daughter’s health (she had a heart transplant as a baby and is now 6 yo and doing well, but I still am in constant fear of rejection, post-transplant cancer, infections, etc. I am also in fear of financial difficulties completely overwhelming my family. Losing my job (which provides my health benefits). So many things…they are constantly popping up and I feel like I’m constantly praying out of fear. What are some of your most frequent fears, and how do you combat them? The death of one of my children. The fear that I’m not worth loving. Beth Moore said something once in one of her studies that has always stuck with me… she encouraged us to take our greatest fear and be honest about how we’d feel. I’d feel devastated. I’d mourn. Etc. Then add to it the reminder “But God will be my strength.” Or something to that effect. So I try to acknowledge my fears for what they are… and then practice knowing and believing that while it would be awful, God will be my strength. This review and interview is a not miss. Thanks for linking up with Literacy Musing Mondays.